Dialectical Behaviour Therapy (DBT) is a psychotherapeutic approach designed particularly to treat the problems of chronically suicidal individuals with borderline personality disorder (BPD). The therapy articulates a series of principles that effectively guide clinicians in responding to suicidal and other behaviours that challenge them when treating this population. 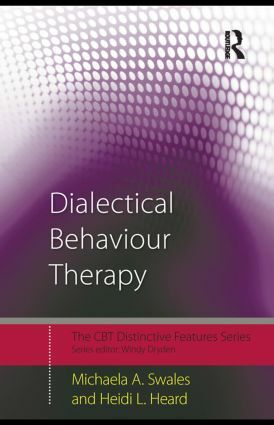 Dialectical Behaviour Therapy highlights 30 distinctive features of the treatment and uses extensive clinical examples to demonstrate how the theory translates into practice. In part I: The Distinctive Theoretical Features of DBT, the authors introduce us to the three foundations on which the treatment rests – behaviourism, Zen and dialectics – and how these integrate. In part II: The Distinctive Practical Features of DBT, Swales and Heard describe both how the therapy applies these principles to the treatment of clients with borderline personality disorder and elucidate the distinctive conceptual twists in the application of cognitive and behavioural procedures within the treatment. This book provides a clear and structured overview of a complex treatment. It is written for both practicing clinicians and students wishing to learn more about DBT and how it differs from the other cognitive behaviour therapies.